My son's sweater after he dried it in the dryer. 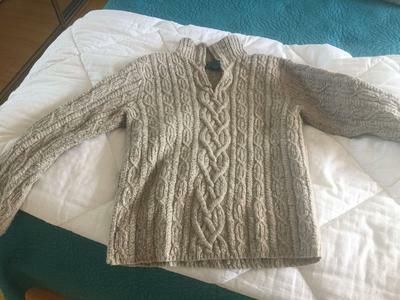 My 19-year-old washed his favorite ski sweater - and actually dried it in the dryer on high heat. The sweater shrunk so much he couldn't even pull it over his head! When he brought it to me, he apologized (I'd given it to him for Christmas) and said he was so sorry he ruined it in the dryer. He was quite surprised when I told him there was a chance we could actually save the sweater! We first pinned it as far as we could stretch it. We did this again about 4 or 5 times over an afternoon. Our last pinning session had the sweater as big as it was when it went into the machine. Although it took almost two full days for the sweater to dry, the sweater now fits him again! And my son actually learned something about laundry. It was so worth the effort! Great to hear the sweater was returned to size! It's hard not to give up on clothes when they shrink. It seems so hopeless! This is a good reminder about not giving up. Thanks for sharing your son's sweater mishap and redemption story, Diane! Just goes to show that, especially when it comes to laundry, never, never, never give up! Join in and write your own page! It's easy to do. How? Simply click here to return to Need to Unshrink a Sweater? Tell Your Story!.